TestWeaver, our intelligent test automation solution, creates and runs system tests to detect errors, achieving maximal test coverage with minimal specification effort. Functional requirements are modeled as system invariants. To do so, TestWeaver provides a simple but powerful modeling language: The Requirement Modeling Language (RML). RML models are translated by TestWeaver into C / C ++ code and provided in executable form, for example as FMU, to the simulation. Thousands of RML models can run in any scenario in real time, or even faster. As a result, all requirements are continuously monitored in all scenarios, whether specified by test script, measured on the road, or automatically generated by TestWeaver. The increased density of the monitored conditions combined with the large coverage of the applied test stimuli yields outstanding results for the systematic test of complex systems. Function test: Comprehensive. Intelligent. Autonomous. Switch to an agile development process with continuous integration and test! After an initial effort to set-up the process, the tests with TestWeaver can be performed automatically, from module level up to the virtual system level – for instance with nightly builds. This way, software bugs can be detected and corrected earlier in simulation, before even moving the vehicle. Huge numbers of driving situations must be considered and safe-guarded before releasing automated driving functions. Car, driver, traffic, street and environment conditions interact combinatorically. 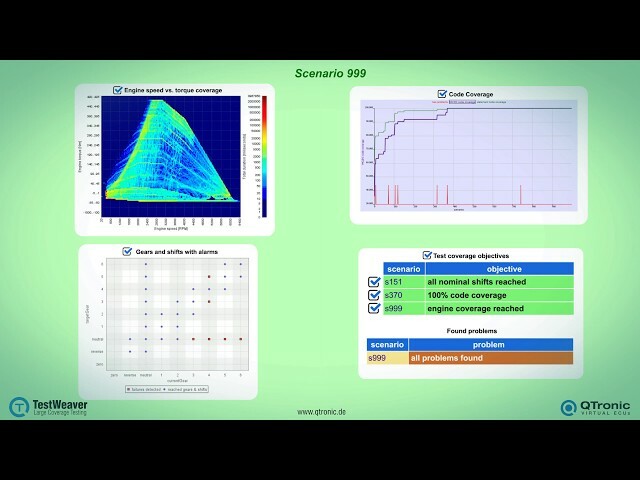 Simulation with automated large coverage testing, as provided by TestWeaver, seems to be the only conceivable approach able to reach the test coverage level required by these applications. TestWeaver is used by leading car manufacturers and suppliers, for example by AMG, Bosch, Daimler, Ford, IAV, Porsche, TREMEC, Volvo Cars and ZF.